"The work Antoinette has done with the leadership team gives us exactly what we need - a focus on developing the business rather than working in the business." Research over the last two decades has shown that the top team has a significant impact on an organisation’s outcomes. Developing the top team has never been more important. How can we develop team meetings that the members actually look forward to and leave them more focussed and connected than before? How can we enable each team member to achieve much more than they could by just working in parallel with others? How can the team generate new thinking together, rather than just exchange the thoughts the team members already know? Leadership team Coaching is a process of working with the whole team to enable a team to function as more than the collective of its individuals. We work with leadership teams who have ambitious plans and wish to build on their achievements to date. Their goal is to become a more effective, high performing team for the benefit of the organisation and themselves as individuals. Since leadership teams work in annual business cycles, we typically work with clients for at least twelve months. Our starting point is a kick-off meeting with key stakeholders. We agree what is working and what needs to change as a result of the team coaching programme. We then work with the leadership team to co-design the Coaching Programme. We use the PRIDE High Performing Team Questionnaire to benchmark team performance. That way, we identify strengths, explore development needs and agree the coaching journey. We work with the team as a whole for a full day once a quarter to develop the areas identified in the PRIDE framework. Between the team coaching sessions, we work one to one with individual team members. We raise their self-awareness, develop their leadership capability and reinforce learning. We have looked at the highest performing teams and asked “what is the difference that makes the difference?” We work with your team to develop five factors encompassed in our PRIDE Model. Purpose: We help you define the unique contribution that only this team can achieve together. We ensure a clear mandate for the team from its stakeholders on what it must deliver. 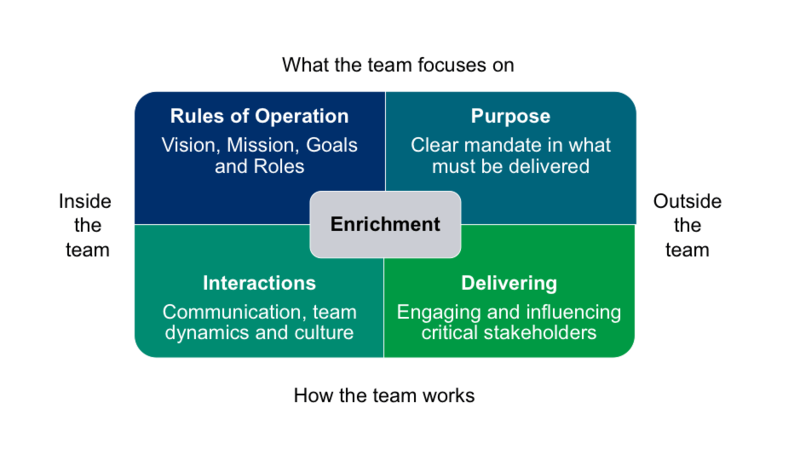 Rules of Operation: We help you gain clarity on your vision, mission, goals and roles. Interactions: We work with you to build the right team culture and dynamics, underpinned by trust. Delivering: We help you determine strategies for engaging and influencing stakeholders outside the team. Enrichment: We revisit the agreed outcomes and measures to celebrate progress and identify areas for development.